Waste management always comes with a golden rule: reduce, reuse, recycle. At first, this feels like a daunting prospect, like an excessive amount of effort. But in reality, this can be achieved if the issue is targeted at the root: the household. Living in an apartment complex means living in close proximity to other. So naturally, we need to stay mindful of maintaining clean surroundings to keep it from being an inconvenience. Enforce a segregation rule in all the units of your apartment complex. Have every household maintain one dustbin for wet waste and one for dry waste. Make sure that the waste is also collected separately. This makes the waste easier to dispose of. Emphasize the need to drain the waste of liquids before throwing it in the bins. The liquid in the waste creates a breeding ground for pests and allows rot to settle in faster. Once the household is taken care of, cleanliness has to be maintained in the common areas of the society. The most effective technique is to hire cleaning crews to sweep and clear the litter. It is also imperative to reduce little. install clearly marked dustbins all over your complex. Place them in all the convenient locations and spread the news urging your residents to use them. Also, urge your residents to clean up after their pets. Pet excreta should be picked up by the owners and disposed of responsibly. Disposables used for any community event should also be biodegradable. Hold regular cleaning drives and educational sessions to ensure that both children and adults are regularly reminded of the importance of clean surroundings. While immediate steps ensure waste management, you need to install mechanisms that make the job easier in the long run. Educate your residents of the importance of recycling paper and plastic waste. If possible hire a service to come to the complex to collect the recyclables. Plant plenty of trees in your society. Not only does this help clean the air of pollutants, but it also helps slowly replenish the soil while making your society look aesthetically pleasing. Also, ensure that the drainage system of your society is in good working condition. Waterlogging causes problems with mosquitos, flies and other pests. Lastly, consider installing a compost pit in your society. This can help you dispose of the biodegradables right within your society. The compost can be used as manure for your trees and gardens. Any surplus can be sold to bring a good revenue for your society. 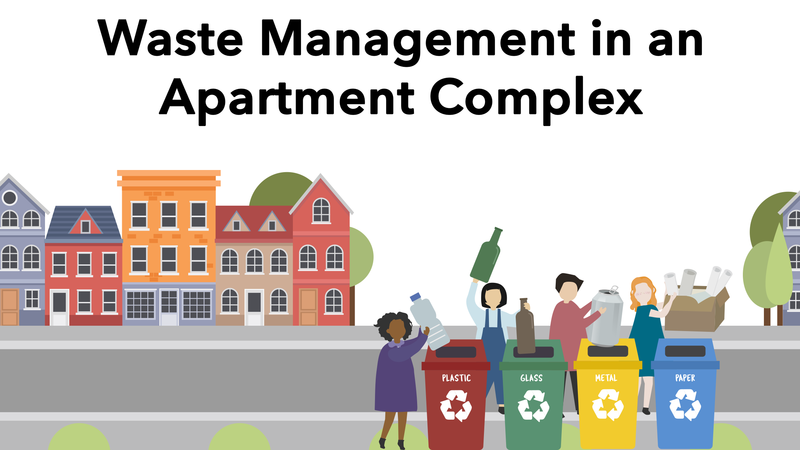 There are plenty of other techniques and real-life examples of good waste management. You can use the ApnaComplex noticeboard feature to educate and notify all your residents. Sharing them with others can only help generate awareness and possibly action towards a cleaner India.